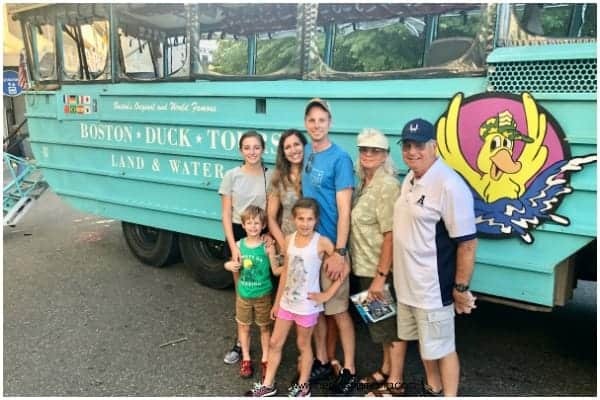 If you find yourself in Boston and you’re looking for a great time, The Boston Duck Tours should be your next adventure. This activity is good for all ages. Whether your kids are young or old this is definitely a family friendly tour. Learn about Boston’s long line of history as you stroll down the streets and float along the Charles river. Out of all the activities we’ve done in Boston over the past year this one is my kids favorite and they still talk about it when we mention our Boston trips. Small children all the way up to older adults are sure to enjoy this 80 minute land/water ride. The Duck as they call it is a W.W.II Style amphibious vehicle. The duck boat goes on land and water. The greatest thing about this tour is you get the best of both worlds. 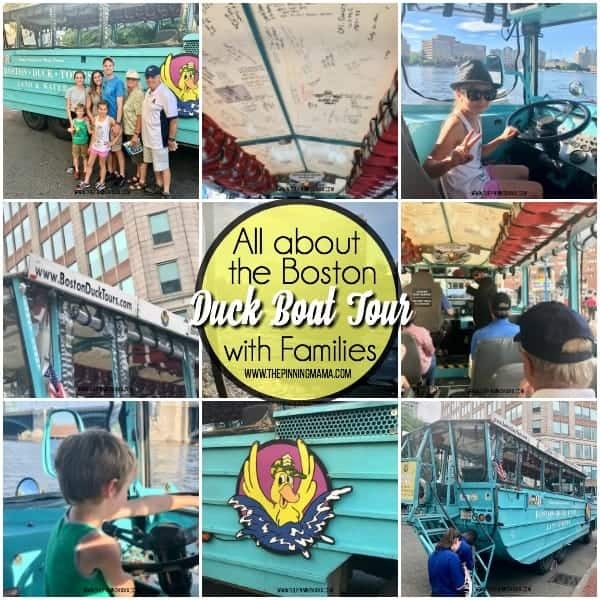 You will first tour the city of Boston, then embark on a journey floating along the Charles river. The duck boat features a driver and a “Conducktor” that acts as the narrator for the ride. Our Conducktor was very witty and had lots of jokes to tell, he was also very knowledgeable and filled us full of history from all around Boston. Where does it depart form? The tours can depart from a few different areas around Boston. The areas of departure are the Prudential Center, the Museum of Science, and the New England Aquarium. These different departure sites make it possible for you to aboard the boat wherever you are located. How do I buy tickets and what is the price? The best way to buy tickets is online a few days before or in the morning to ensure you get the time slot you would like. The tours fill up pretty quickly and especially in the summer months, so booking a few days early is safer. We booked our tickets online and then the confirmation/tickets are sent to your email. All you need to do is have your email open at the time of departure and they will scan your tickets as you board the Duck. The seats are assigned to you when you buy the tickets. If you have a large party I would definitely book in advance to ensure all of you can get on the same Duck. Ticket prices are Adult $41.99. Senior or Military $33.99, Child 3-11 $27.99, and lap child less than 3 years $10.50. Wheelchair accessible Ducks are available departing from the Museum of Science and the Prudential Center. Please let the company know in advance so they can have all the equipment there that is necessary to assist those needing wheelchair assistance. What do I see on my tour? First off on your tour you will pass by all the places that made Boston so famous and gave us our freedom. A few places you will see is Faneuil Hall, Quincy Market, Boston Commons, Beacon Hill, Old State House, Prudential Tower and much much more. All along the way you will learn fun facts about Boston. It’s like taking a history class during your tour. After touring the city its time to take a dip in the Charles River. On the river you will experience views of the Cambridge Skyline. The kids also on the Duck Boat also get a change to drive the boat for a few minutes and my kids loved it. As you can tell this tour is well worth your money and a great way to tour the city without dealing with all the traffic as the driver. It’s fun to learn all about the buildings and sites while you drive around in the Duck Boats. My kids keep telling their friends all about the fun water/land boat they went on.